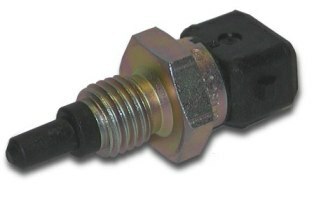 High quality "NTC" type air temperature probe manufactured by Bosch. Overall length of 49mm, and a fitting thread of M12 x 1.5mm pitch. Temperature range of -10�C to 100�C. The resistance of the sensor changes with temperature. For direct connection to the Data Logging Units a "pull up resistor" is required. If the sensor is ordered with a cable, this resistor is already included and will be ready for immediate use. Installation Instructions Physical installation is to be such that the front part of the sensing element is directly exposed to the airflow. The sensing element of the NTC temperature sensor (NTC = Negative Temperature Coefficient) is a resistor comprised of metal oxides and oxidised mixed crystals. This mixture is produced by sintering and pressing with the addition of binding agents. For automotive applications, NTC resistors are enclosed in a protective housing. If NTC resistors are exposed to external heat, their resistance drops drastically and, provided the supply voltage remains constant, their input current climbs rapidly. This property can be utilised for temperature measurement. Please note, each 2-pole plug requires 1 plug housing, 2 contact pins and 2 individual gaskets. For automotive applications, original AMP crimping tools must be used. And the sensor can be attached without further complication. Please note the Bosch temperature sensors, these require an external 1000 ohm resistor to operate. If you have purchased the sensor from us with a cable attached then the resistor will be included and nothing more needs to be done. If you have purchased the sensor without any cable the resistor will need to be added as shown in the diagram below. Note that if you are connecting the sensor to a DASH2, then the equation can be simply selected from the drop down list in the configuration software. Similarly, if the sensor is to be attached to a DL1/DL2 then the equation can be simply selected from the relevant section in the variable manager of the analysis software.